Process Operator - Utilities, Edmonton, Alberta, Canada Hot! Development Specialist, Calgary, AB, Canada Hot! Training Coordinator (Petro-Canada) / Formateur (Petro-Canada), Montreal QC, Canada Hot! Formateur (Petro-Canada) / Training Coordinator (Petro-Canada), Montreal QC, Canada Hot! Petrophysicist, Aberdeen, Scotland, United Kingdom Hot! Team Leader Supplier Enablement, Calgary AB, Canada Hot! Project Manager - Finance Integration, Calgary AB, Canada Hot! Security Coordinator, Calgary, AB, Canada Hot! Executive Assistant, Calgary, AB, Canada Hot! Terminal Supervisor, Commerce City CO, USA Hot! Supply Trader, Denver CO, USA Hot! Transportation Analyst, Denver CO, USA Hot! Senior Market Analyst, Houston, Texas, USA Hot! Senior Market Analyst, London, ENG, USA Hot! Project Controls Analyst, Mississauga ON, Canada Hot! Senior Market Analyst, Calgary, AB, Canada Hot! Emergency Response Officer, Fort McMurray AB, Canada Hot! Contracts Management Specialist, Calgary AB, Canada Hot! Electrician, Primary Extraction, Fort Hills AB, Canada Hot! Senior Contracts Management Specialist, Calgary AB, Canada Hot! Analyst Supply Chain Technology, Calgary AB, Canada Hot! Operator Trainee, Commerce City CO, USA Hot! Retail Risk Auditor, Denver CO, USA Hot! Rotating Equipment Specialist, Fort McMurray AB, Canada Hot! Contract Coordinator (Mine Equipment Maintenance), Fort McMurray AB, Canada Hot! Senior Inventory Analyst, Mississauga ON, Canada Hot! Senior Finance and Planning Analyst, Calgary AB, Canada Hot! Instrumentation SCADA Specialist, Sherwood Park AB, Canada Hot! Terminal Operator Student, Oakville ON, Canada Hot! Mining Development Lead, Fort McMurray AB, Canada Hot! IT Operations Analyst (Petro-Canada), Mississauga ON, Canada Hot! Engineering Lead, Fort Hills Wood Buffalo AB, Canada Hot! Production Geologist, Fort Hills Wood Buffalo AB, Canada Hot! Asset Integrity Engineer - Piping, Fort McMurray AB, Canada Hot! Construction Coordinator, Fort McMurray AB, Canada Hot! Health and Safety Advisor, Fort McMurray AB, Canada Hot! Senior Reporting and Analytics Advisor, Calgary AB, Canada Hot! Human Resources Systems and Integration Advisor, Calgary AB, Canada Hot! Communications Specialist (Digital Programs), Calgary AB, Canada Hot! Senior Digital Employee Communications Advisor, Calgary AB, Canada Hot! Senior Mine Engineer, Fort McMurray AB, Canada Hot! Analyst, Wholesale Credit Business Support, Mississauga Ontario, Canada Hot! Advisor, Occupational Health Nurse Casual, Edmonton Alberta, Canada Hot! Engineer-in-Training, Geotechnical, Calgary Alberta, Canada Hot! Analyst, Database, Calgary Alberta, Canada Hot! Recruiter, Calgary Alberta, Canada Hot! Senior Auditor, Operations Integrity Audit, Calgary Alberta, Canada Hot! Engineer-in-Training, Process, Fort McMurray Alberta, Canada Hot! Recruiter, Fort McMurray Alberta, Canada Hot! Engineer, Projects, Fort McMurray Alberta, Canada Hot! Emergency Response Officer, Base Plant, Fort McMurray Alberta, Canada Hot! Advisor, Alcohol and Drug Case Manager, Calgary Alberta, Canada Hot! Senior Development Lead, Calgary Alberta, Canada Hot! Emergency Response Officer, Fort McMurray Alberta, Canada Hot! Senior Engineer, Mine and Tailings Planning, Calgary Alberta, Canada Hot! Junior Geotechnical Engineer, Calgary Alberta, Canada Hot! Operator, Damage Prevention, Fort Lupton Colorado, USA Hot! Coordinator, Operations Training, Fort McMurray Alberta, Canada Hot! Water Resources Engineer, Calgary Alberta, Canada Hot! Onboarding Coordinator, Calgary Alberta, Canada Hot! Manager, Supply Chain Management, Renewable Energy, Calgary Alberta, Canada Hot! Coordinator, Land Management, Fort McMurray Alberta, Canada Hot! 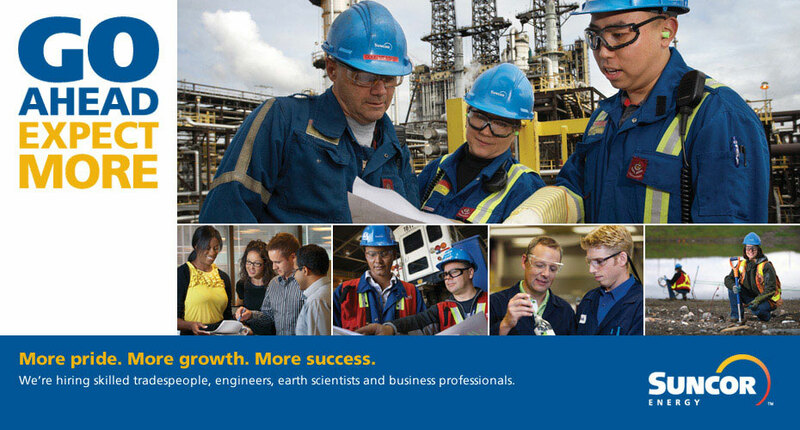 Process Engineer, Industrial Utilities and Facilities, Fort McMurray Alberta, Canada Hot! Hydrogeologist, Calgary Alberta, Canada Hot! Senior Hydrogeologist, Calgary Alberta, Canada Hot! Senior Analyst, Sales and Marketing Accounting, Mississauga Ontario, Canada Hot! Co-op Student - Application Support Analyst, Calgary Alberta, Canada Hot! Maintenance Planner, Fort McMurray Alberta, Canada Hot! Manager Maintenance, Utilities, Fort McMurray Alberta, Canada Hot! Supervisor, Mine Dispatch, Fort McMurray Alberta, Canada Hot! Engineer, Project, Fort McMurray Alberta, Canada Hot! Coordinator, Onboarding, Fort McMurray Alberta, Canada Hot! Advisor, Diversity and Inclusion, Calgary Alberta, Canada Hot! Team Leader, Warehouse, Commerce City Colorado, USA Hot! Advisor, Reporting and Analytics, Calgary Alberta, Canada Hot! Superintendent, Building, Fort McMurray Alberta, Canada Hot! Superintendent, Utilities, Fort McMurray Alberta, Canada Hot! Specialist, Contractor Safety, Calgary Alberta, Canada Hot! Projects Lead, Calgary Alberta, Canada Hot! Industrial Hygienist, Fort McMurray Alberta, Canada Hot! Senior Advisor, Supply Chain Management Sustainability, Calgary Alberta, Canada Hot! Co-op Student, Business, Calgary or Fort McMurray Alberta, Canada Hot! Co-op Student, Accounting and Finance, Calgary or Fort McMurray Alberta, Canada Hot! Shift Supervisor, Mine Operations, Fort McMurray Alberta, Canada Hot! Shift Supervisor, Mine Equipment Maintenance, Fort McMurray Alberta, Canada Hot! Engineer, Applications, Sarnia Ontario, Canada Hot! Co-op Student, Computer Science [Bucket], Calgary or Fort McMurray Alberta, Canada Hot! Co-op Student, Civil Engineering [Bucket], Calgary or Fort McMurray Alberta, Canada Hot! Co-op Student, Mining Engineering [Bucket], Calgary or Fort McMurray Alberta, Canada Hot! Co-op Student, Electrical Engineering [Bucket], Calgary Alberta, Canada Hot! Co-op Student, Chemical Engineering [Bucket], Calgary or Fort McMurray Alberta, Canada Hot! Co-op Student - Mechanical Engineering [Bucket], Calgary Alberta, Canada Hot! Heavy Equipment Operator, Temporary, Fort McMurray Alberta, Canada Hot!